Commercial vehicle contract hire and fleet management company, Prohire Limited has supplied the leading supplier of disposables, food packaging and hygiene solutions in the UK, Bunzl Catering Supplies with a fleet of new high specification Mercedes Actros tractor units, fitted with the latest fuel saving technology and safety features. This follows on from the supply of new vehicles for the opening of the Bunzl Catering Supplies Harlow branch which increased the distributor’s network of operating branches to seven plus its national distribution centre in Tamworth. Prohire has since supplied new 3.5 tonne panel vans, Luton bodied vehicles, 7.5 tonne to 18 tonne rigid vehicles with box bodies and semi-trailers. Together with the most recent order, this brings the total commitment to 110 Bunzlliveried vehicles on long term contract hire, as well as management of fleet uptime and compliance, plus accident management. 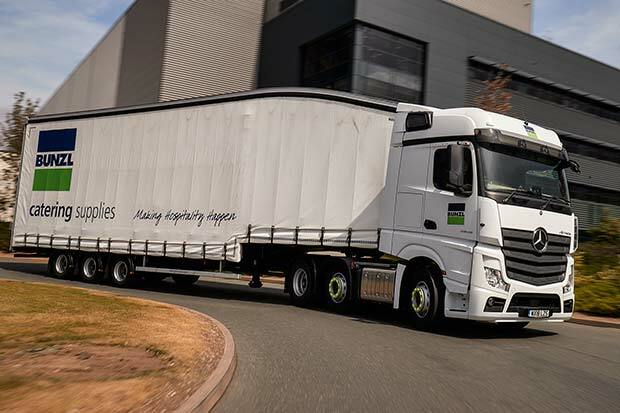 The Bunzl Catering Supplies fleet operates on a 48-hour delivery cycle, with day one orders arriving on day three to ensure that its catering and hospitality customers always have stock of non-food consumables, such as paper cups, burger boxes and hand towels. Part of Bunzl plc, Bunzl Catering Supplies utilises its global resource to source, consolidate and deliver a complete range of non-food consumable products to the catering and hospitality sector. Prohire supplies commercial vehicles and full fleet support services to a wide range of business sectors including foodservice and catering, chilled food and pharmaceuticals, builders’ merchants, leisure retail and the brewing industry as well as to specialist logistics companies.